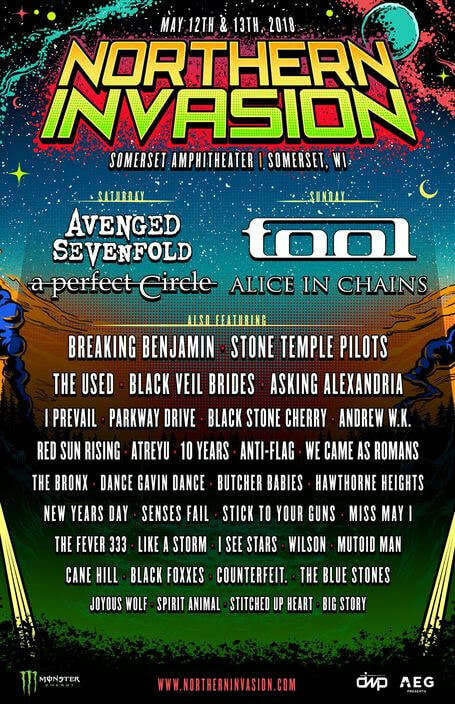 ﻿Published by Sareth Ney on Dec. 11, 2017 at 10:38 a.m.
SOMERSET, Wis. – Northern Invasion takes place at Somerset Amphitheater, on May 12 and May 13. Tool, Avenged Sevenfold, A Perfect Circle and Alice in Chains co-headline. It is produced by AEG Presents and Danny Wimmer Presents. It is brought in part by Monster Energy and part of the World’s Loudest Month. There are over 12 hours of music on each day, as well as a top tier camping experience and Northern Invasion Good Eats. Joining Tool, Avenged Sevenfold, A Perfect Circle and Alice in Chains are: Breaking Benjamin, Stone Temple Pilots, The Used, Black Veil Brides, Asking Alexandria, I Prevail, Parkway Drive, Black Stone Cherry, Red Sun Rising, Andrew W.K., Atreyu, Anti-Flag, 10 Years, We Came As Romans, The Bronx, Dance Gavin Dance, Butcher Babies, Hawthorne Heights, New Years Day, Senses Fail, Stick To Your Guns, Miss May I, Like A Storm, The Fever 333, I See Stars, Wilson, Mutoid Man, Cane Hill, Black Foxxes, COUNTERFEIT., The Blue Stones, Joyous Wolf, Spirit Animal, Stitched Up Heart and Big Story. Special priced active military discounts with GovX are available at www.govx.com. Campgrounds open from May 11 through May 14. Doors open at 11 a.m.